Not every shot rings as true as a hunter would like. It is a sad thing, to injure animals. But, alas, it happens. That was the case with my “Duck Buck” this year. 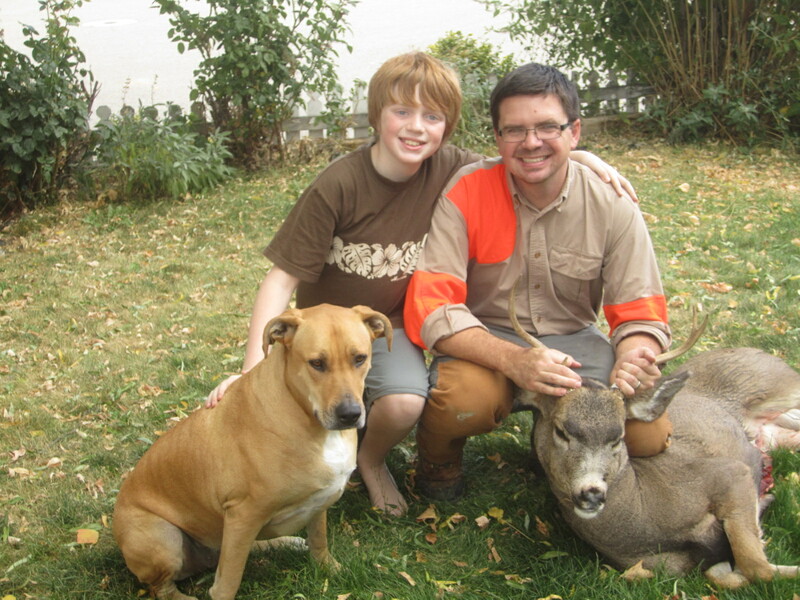 While out jumping ducks on a creek my good friend winged a small mule deer buck with his 7mm. Post shot we looked extensively for evidence of a hit on the buck. Not a drop of blood, nothing to indicate that he was hit. We called it a miss and he went home. This buck was put down while the dog, boy and I went looking for some ducks. He has two names now – “The Duck Buck” and/or “Ryan’s Buck.” Not the biggest but it will be some fine eating corn fed organic gub. Fortunately, I decided to walk the other side of the creek for a duck with my young son. A rooster pheasant jumped and I took a shot over the corn. When I did the buck jumped up only 4 yards in front of me! It was clear that the buck was injured and I recognized the horns as the buck that had been shot at earlier. Armed with nothing but some size four steel shot I raised the buck to the ground.The buck had been hit in the hind leg and suffered from considerable blood clotting. It was sad to see the buck suffering for that long, but I was happy to put it down. The next thing I knew I was giving an impromptu lesson on gutting a deer to my recently graduated from Hunters Education son. It was a truly impactful experience for him, I could see his eyes light up when we I made him name certain organs. I made him hold the heart, keep the legs up while I gutted. He helped drag the buck as well. In a few years I will be helping him. I can’t wait!